In the midst of the Armenian genocide, two women are forced on a death march with their 10 children. The two women lose all their children in the journey, and carry their unbearable burden the rest of their lives. 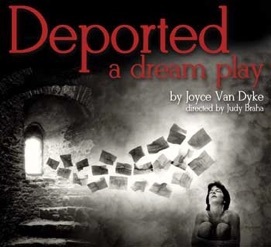 Based on true events taken from the author’s family history, Deported, a dream play transports the characters thru 100 years of life, death, and all of that which is past forgiving. A dry, dusty string instrument provides the theme, drifting memories of ancestors singing, crying, a baby in distress, the sounds of the wind and the river recall the journey, a woman sings a song without words.